My love for smoothies has been wicked strong since way back in 2010 when I was a youngin’ in college. 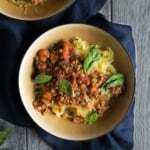 When I first started learning about nutrition and fitness, I was adamant about gaining some muscle and learning how to refuel my body after a workout. Smoothies with a little protein powder or greek yogurt were an easy way to get protein, vitamins and nutrition in! Smoothies aren’t just for breakfast though; I’ll often have one an hour or so before bed. I especially love when you can make them taste like ice cream, which is exactly what today’s smoothie reminds me of. Specifically I’m wondering if you remember Neapolitan ice cream? It’s a little difficult to find now, but I loved it when I was a kid. A scoop of all three wonderful flavors: strawberry, vanilla, and chocolate. Oh hells yes. My version calls for banana in the middle because I kind of wanted it to be like a banana split. 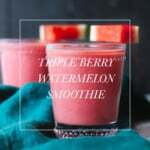 This smoothie is made in partnership with Almond Breeze. Most of you already know I bake with their almond milk all the time, but this time I wanted to their new extra creamy vanilla cashewmilk almondmilk! It’s ridiculously good and perfect for smoothie-makin’. Oh and I LOVE the flavor. It’s very subtle creamy cashew goodness. 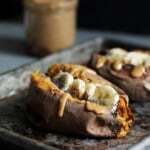 -Use frozen bananas. They make a difference in the thickness of the smoothie and are critical. I like to peel my bananas, then place them in a ziploc bag and freeze overnight. 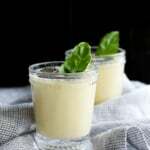 -Use a vanilla protein powder or one that you really love! I haven’t tested this recipe without protein powder so I’m not sure how it would turn out if you didn’t use it. I think you could use greek yogurt and reduce the amount of almondmilk. -Use Almond Breeze’s Almondmilk Cashewmilk blend or their regular unsweetened original Almondmilk to add to the creaminess. -Don’t worry about it being perfect. 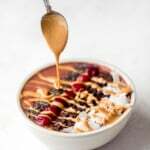 You can also make this into a smoothie bowl and swirl everything together! Layered banana split protein smoothies perfect for after a workout or as a late-night treat. They taste exactly like a banana split! Great drizzled with a little peanut butter or topped with coconut whipped cream. Make the chocolate layer first: In a blender, add in frozen banana, protein powder, cocoa powder, chia seeds and milk. It should be THICK. Divide between 2 medium glasses and place in the freezer. Rinse the blender, then make the banana layer by adding frozen banana, protein powder, chia seed and milk. Blend until thick, smooth and creamy. Gently layer banana smoothie onto chocolate smoothie, gently spooning it around the inside edge of the glass. Place glasses back inside the freezer. 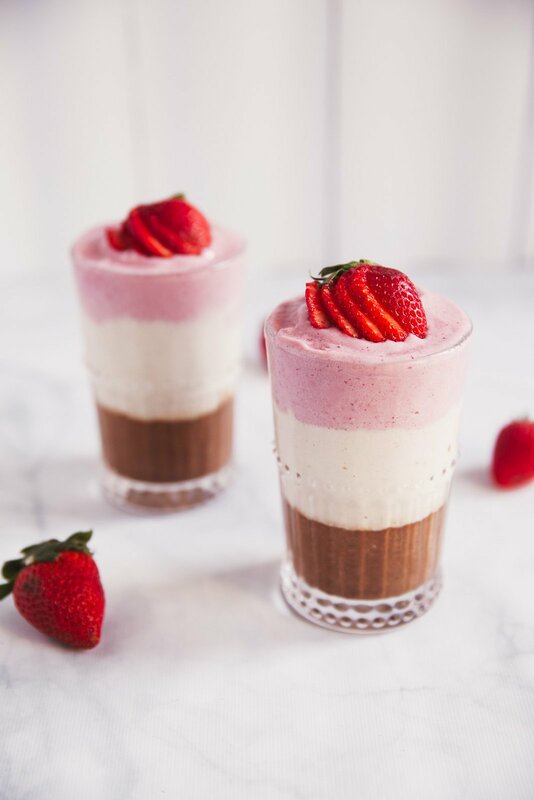 To make the strawberry layer: Blend strawberries, protein powder and almond milk together. Again, you want this to be pretty thick, but you may need to add in more almond milk to make it blend. 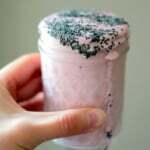 Once strawberry smoothie is thick and creamy, gently spoon it over the chocolate layer. Place glasses back in the freezer again for a few minutes, then enjoy! 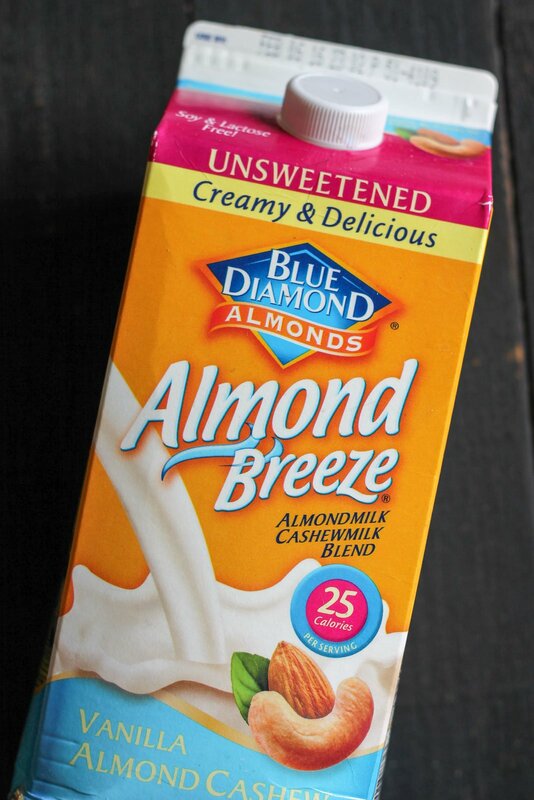 This post is in partnership with Almond Breeze! 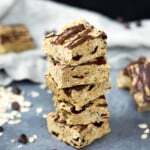 I love baking with their non dairy milks and enjoy sharing dairy free recipes with you! Thanks for continuing to support AK and the brands that help make this site possible! Weekend Favorites: 2.26.16 Best of February 2016: Food, Travel & Fun! 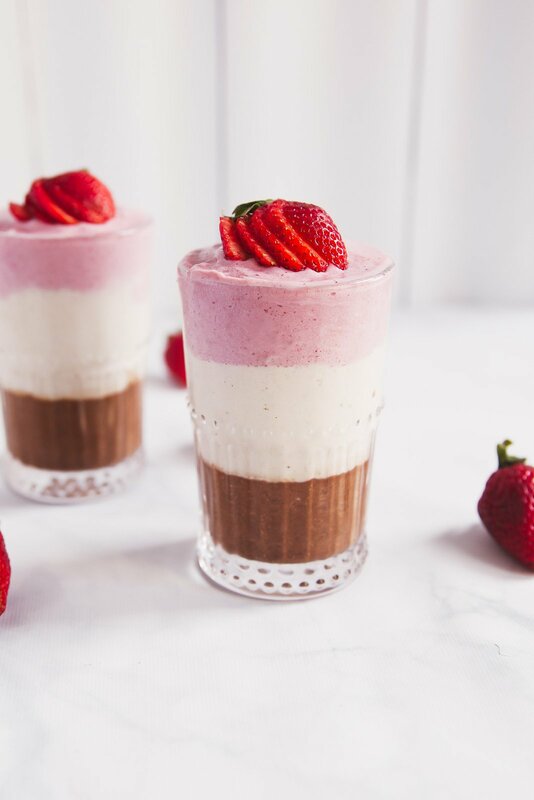 32 Responses to "Layered Banana Split Protein Smoothie"
Ahh this is so so pretty! I’m a huge advocate of the whole “pretty food tastes better” mindset 😉 Cannot wait to try this out soon! Amaaaazing!! Way to perk up Monday girl! This looks perfect! I love that cashew milk it is so delicious! I love all the flavors of this classic! And that addition of banana is perfect! Monique, I LOVE these – the colors, the neapolitan flavors (my favorite) and the idea of having it as my sweet treat before bed. I always need a little type of dessert after dinner and this would be perfect and one of the best things for me. I’m excited to try this new blend! I knew they had the separate flavors, but didn’t realize they’d combined them. Thanks for the recipe and enjoy your time in sunny Scottsdale! I like the layers, and my 11-year-old would like them even more! Which protein powder do you usually use? Have fun in AZ. Digging the snaps. I love these layers!!! Good tip about freezing the bananas! Can’t wait to try this. I am loving layered smoothies right now! Can’t wait to try this recipe! This is so pretty! I need to find that milk! Cashew milk is my new favorite. The layers are super pretty, and it looks just like Neopolitan ice cream. Smoothies are the best, and I hope you enjoy your time in Arizona. These look so tasty. What kind of protein powder do you suggest using? My kids don’t care for the taste of protein powder so I have to make sure it’s a good one. Can’t wait to make this. I was so jelly of your time in AZ! Looks like you gals had a blast. And I can’t wait to try this smoothie! Genius! Layer smoothies are so gorgeous, but I hate having to deal with cleaning the blender every time! I don’t know what difference it would make, so my solution is to just reverse the layers and do chocolate last so the colors don’t mess up! 😀 Anyways, I think that smoothies that taste like ice cream AND are high in protein are the best types of smoothies in the world! Such a LOVELY recipe!! I need to go some of that milk ASAP! Finally got around to trying this and it was very tasty! I also never really use protein powder, just cause I opt for pb or yogurt for sources of protein in my smoothies, so this was a very good intoduction to the stuff! It wasnt scary at all;) now I have other layer smoothie ideas running through my head…love it. I finally got around to trying this and it was quite good!!! 🙂 I had never really tried protein powder before ’cause I normally opt for pb or yogurt as my protein source in smoothies so this was a great introduction to the stuff. It was not scary at all;) I love how it’s sweet enough without honey or truvia. Woops, I commented twice. Lol.